How to find the area with this isosceles triangle calculator? Isosceles triangle calculator is the best choice if you are looking for a quick solution to your geometry problems. Find out the isosceles triangle area, its perimeter, inradius, circumradius, heights and angles - all in one place. If you want to build a kennel, find out the area of Greek temple isosceles pediment or simply do your maths homework, this tool is here for you. Experiment with the calculator or keep reading to find out more about the isosceles triangle formulas. The equilateral triangle is a special case of a isosceles triangle. 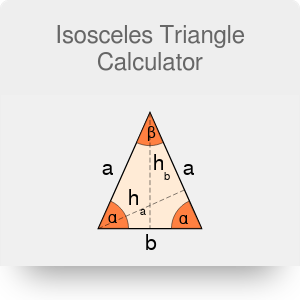 Also, you can check our triangle area calculator to find out other equations, which work for every type of the triangle, not only for the isosceles one. Isosceles triangle theorem, also known as the base angles theorem, claims that if two sides of a triangle are congruent, then the angles opposite to these sides are congruent. Also, the converse theorem exists, stating that if two angles of a triangle are congruent, then the sides opposite those angles are congruent. Determine what is your first given value. Assume we want to check the properties of the golden triangle. Type 1.681 inches into leg box. Enter second known parameter. For example, take a base equal to 1 in. All the other parameters are calculated in the blink of an eye! We checked for instance that isosceles triangle perimeter is 4.236 in and that the angles in the golden triangle are equal to 72° and 36° - the ratio is equal to 2:2:1, indeed. You can use this calculator to determine different parameters than in the example, but remember that there are in general two distinct isosceles triangles with given area and other parameter, e.g. leg length. Our calculator will show one possible solution. Isosceles Triangle Calculator can be embedded on your website to enrich the content you wrote and make it easier for your visitors to understand your message.